Nature has shown such amazing color in the last day. A big spring storm was projected for the day, and indeed the prediction was right. Bands of heavy rains interchanged with sunny skies and finally finished late in the afternoon. 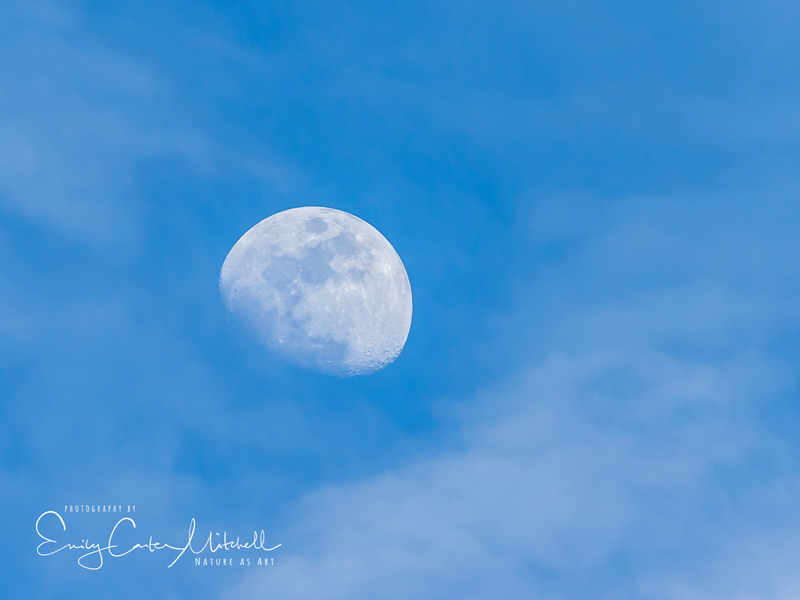 While watching Esperanza on her nest preening after the rain, I watched the moon rise in the light clouds painting in sky blue. 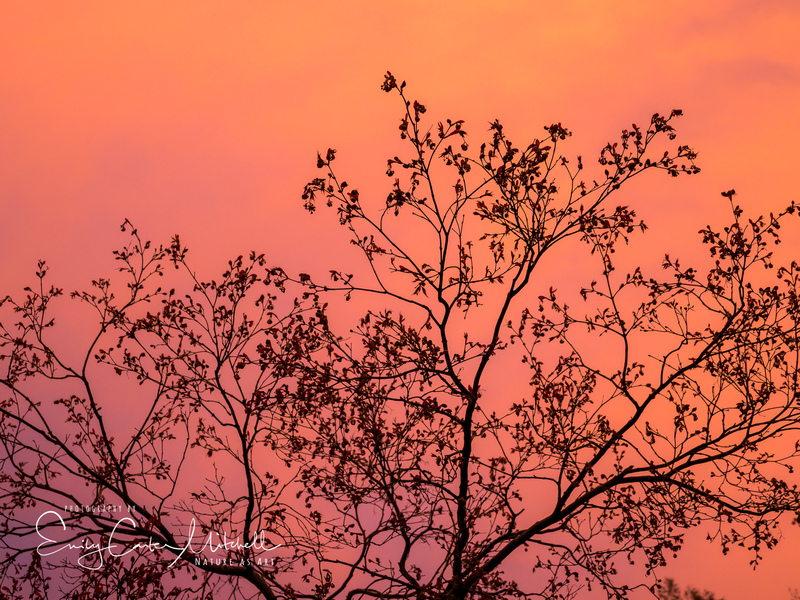 The saying usually goes “Red sky in the morning, sailor take warning” but last night, for a few brief minutes the light turned into a rosy pink. A color that I rarely see. Luckily my habit of keeping a charged camera on the table ready to grab helped and I rushed out to try to capture the incredible light. Thinking as quickly as I could, I used some trees to create an attractive composition. I have recently acquired an Olympus OMD-EM1 Mark II to use for an upcoming international trip. My decision to get this micro-four-thirds mirrorless camera was for the incredible image stabilization it offers. With their new Olympus 24-100mm f4.0 pro lens with it’s own image stabilization, I can go up to 6-stops of image stabilization which is absolutely amazing. I’m testing the kit and my own ability to create sharp images hand holding at super low shutter speeds. Alas, I was a little overly ambitious and at 1/10 of a second with a light breeze I’d be out of my mind thinking I’d get a sharp image. 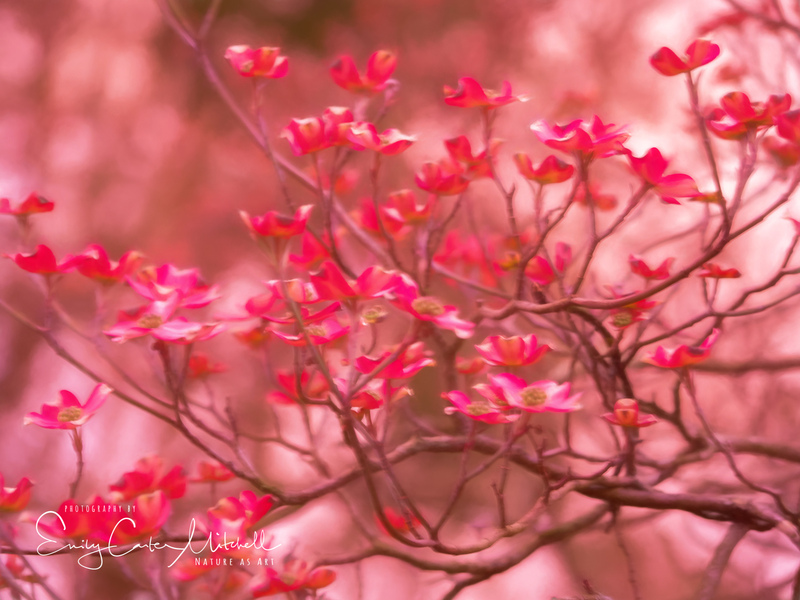 And indeed it was so as the dogwood flowers were just slightly off focus. But I loved the light and I wasn’t ready to just toss the image away. After some vibrance and saturation adjustments in Lightroom, I brought the image below into Topaz Impressions and added a painterly filter and reduced opacity. I think I salvaged the out of focus image rather nicely. What do you think? You humble me Rebecca. Thank you my dear friend. Beautiful. I love the last image. Will be looking forward to images from your trip! Gorgeous! Thanks for sharing, Emily! From my heart to yours dear Fatima. Thank you. I love your images. During these storms I often think about the wildlife. So Esperanza’s nest survived! I watched trees blowing down behind my house. E-M1 II is a great choice and you can’t beat the 1.5cm close focusing distance of the 12-100mm. Robin Wang has posted images that he took with the 300mm f4.0 handheld at 1/10 second. My own experience leads me to believe that it takes practice. Thank you Mark ! Yes ! Esperanza and Zorro survived quite well. In fact, I noticed some afternoon delight in the light drizzle. And the winds today and the nest is strong and sturdy. They’re amazing builders. I was amazed with how close I focused with playing with the E-M1 II. Crazy close – macro close. Super cool ! I’ll have to check out what Robin Wang has done. I know Denise Ippolito did some great bird stuff with it. Super fast AF. The features of this camera are unbelievable. I think I’ll need an engineering degree to understand it all. Beautiful captures – am looking forward to hearing your thoughts on the new camera as I’ve been tempted with one also! So far I love it Joanne ! But it is a quite advanced camera with incredible features. It’s heavier and heftier than I expected but it also is completely weather sealed which is another feature I really wanted. Being completely weather-sealed sounds like a deal-breaker to me. It’s something I really need to consider in this part of the world! Lovely photos! I love my olympus omd! Such great cameras and so light to carry around. I can’t wait to really work with it and thrilled to hear that you like yours so well Mags. Thank you. Hi Em, the OMD EM1 MkII is my main camera. I made the jump to m43 (from a Canon DSLR) a few years ago and haven’t regretted it. I’ve also got their trio of F2.8 pro lenses 7-14mm; 12-40mm and 40-150mm. I’ve been thinking about the 12-100 F4 pro lens for travel, so I’d be interested in your thoughts. What I’d really like though is the 300 F4 pro for wildlife. This is exciting to hear Mark. You may have just become my “dial a friend” life line when I need help. I’ve heard the 300 f4 pro works wonders as well. I’m going to try to work with just the 12-100 f4 pro for now. Although I already want the 60mm Macro and maybe the 7-14mm. Although I did get a fisheye for the wide angle perspectives. I’m going to play with it more before my big trip. Thank you! No worries Em anytime……although I may end up contacting you for help 😊. This big trip sounds exciting……any clues as to destination? 🙂 I’ll let you know …is gran Paris!